Where do POTI students come from? POTI students come from all over the world. The ability for students to study our courses from anywhere at any time allows for a flexibility not often seen in traditionally taught courses in the classroom. How popular are our courses? All courses are provided in English. As resources allow, we have also translated our courses into the following languages: French, Spanish, Portuguese, and Arabic. 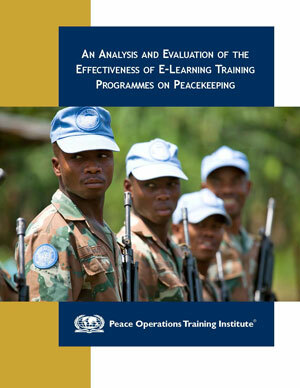 POTI conducted a six-month internal study on the ELAP (E-Learning for African Peacekeepers) programme by running focus groups, conducting interviews, and administering surveys. The individuals queried were current peacekeepers, supervisors of peacekeepers, people involved in the delivery of peacekeeping training at national peacekeeping training centres, and Training Focal Points/Chief Civilian Personal Officers (TFPs/CCPOs) at United Nations peacekeeping missions. Research indicated that 70.8% of ELAP students are currently serving on a peacekeeping mission, 12% have previously served on a mission, and 27.7% hope to serve on a mission in the future. For thousands of African peacekeepers, ELAP is the principal source of training on peacekeeping received before deployment to a peace operation. Of all the ELAP graduates, who have served on a peacekeeping mission within six months of completing their courses with POTI, 44.6% indicated that they had never attended a classroom training course at a national peacekeeping training centre. The training provided through POTI's courses is perceived as highly essential, with 97% of ELAP students, 89% of the peacekeeping training providers at the national peacekeeping training centres, and 73.9% of the TFPs/CCPOs agreeing that POTI’s courses offer peacekeepers practical knowledge to better perform their jobs.